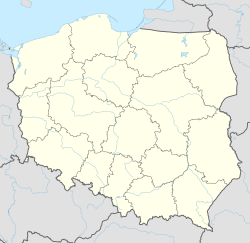 Żarki Wielkie [ˈʐarki ˈvjɛlkʲɛ] (German: Groß Särchen) is a village in the administrative district of Gmina Trzebiel, within Żary County, Lubusz Voivodeship, in western Poland, close to the German border. It lies approximately 7 kilometres (4 mi) south-west of Trzebiel, 27 km (17 mi) west of Żary, and 65 km (40 mi) south-west of Zielona Góra. Before 1945 the area was part of Germany. After World War II the region was placed under Polish administration by the Potsdam Agreement under territorial changes demanded by the Soviet Union. Most Germans fled or were expelled and replaced with Poles expelled from the Polish areas annexed by the Soviet Union. This Żary County location article is a stub. You can help Wikipedia by expanding it.